time goes by, as it always does. i did a couple of shows in the last few weeks including a very nice one in a club close to the beach in ravenna/italy. 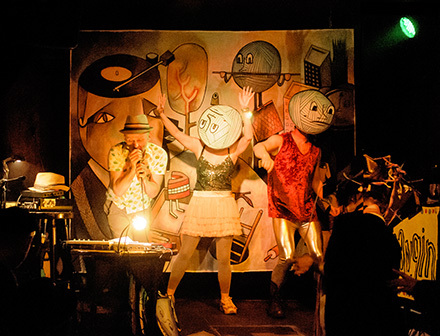 in berlin there is now a group of people, that is coming to all my shows to dance with masks on stage wich is nice, because it doesn't feel so lonely anymore up there but also adds a little bit of extra chaos. at the show in Konzulat i jumped on the mic and destroyed it and by funny coincidence the sound guy was gone for dinner during my show and there was no other mic available. good luck i had this small new keyboard , a little box of wonders named OP-1, that has a built-in mic and so i sang the rest of the show through that keyboard wich looked rather ridiculous but sounded surprisingly good. right now i am in korea with the family - no shows but i have brought that special keyboard with me to work on new songs. i just discovered there is a function that converts a drawing into a sound. by default it came with a little portrait of Karl marx and the words "marx was right".